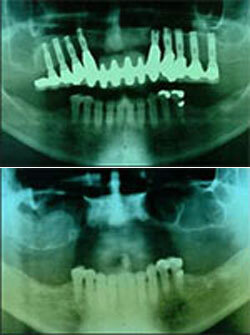 Sometimes the sinus lift procedure and implant placement can be performed as a single procedure. The maxillary sinuses are located behind your cheeks and on top of your upper back teeth. They are like an air filled empty room. If the sinus cavities are large or very low, resulting in a thin wall of bone separating the floor of the sinus and the mouth, then this condition will require a sinus grafting/lift procedure. An incision is made to expose the bone where the teeth used to be. We enter the sinus by creating a “window” in the bone. After elevating or lifting the sinus membrane, donor bone is inserted to restore bone height, which will ensure that a dental implant of adequate length can be placed. After several months of healing and maturing of the bone grafts, the implants can be placed. Sometimes, if enough bone between the upper jaw and bottom of sinus is available to stabilize the implant, the sinus lift procedure and implant placement can be performed as a single procedure.